This White Chocolate Strawberry Ice Cream is incredibly easy to make (waiting for it to chill is the toughest part!) and packed with fresh strawberries and creamy white chocolate for a delicious spring or summer dessert. 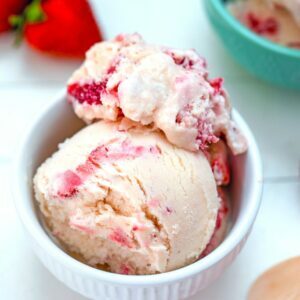 (This recipe for White Chocolate Strawberry Ice Cream was originally posted in April 2012, but was updated with new photos and content in 2018). I’ve always been of the mindset that the more chocolate, the better, when it comes to ice cream. Give me a triple chocolate chocolate chunk ice cream and I’m happy as a duck in a puddle. But the older I get, the more I find myself gravitating away from chocolate and toward the lighter fruiter things in life. I have very mixed feelings about this since I have always considered myself a huge chocolate fanatic and a “keep all fruit away from my desserts, please” kinda gal. But tastes change and obsessions come and go and I’m embracing it. I mean, have you seen how many strawberry desserts have been on the blog lately?? And I’m pretty sure these lemon cookie dough bars are my favorite dessert creation ever. But please, don’t get me wrong; I’d still take a pint of Ben and Jerry’s Phish Food ANY DAY. That is a given. In the midst of my strawberry obsession and in the serious heat of summer, I knew that strawberry ice cream was a must make. Since I knew I wanted more than just a vanilla ice cream base, I decided to re-make this white chocolate ice cream that I remember first enjoying way back in 2012. 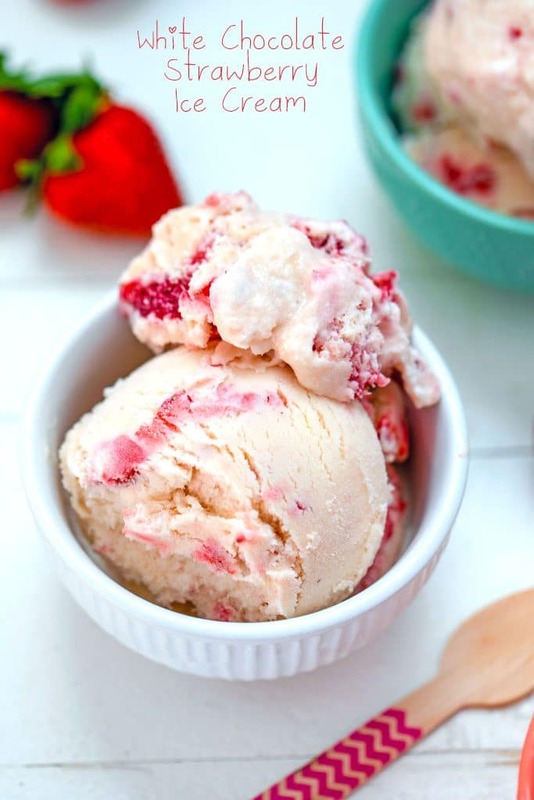 This white chocolate strawberry ice cream is a super simple ice cream to make, with the waiting and chilling the hardest part. As always. But it’s an absolute dream and everything I hoped for and more. I do recommend planning to make this ice cream a day before you want to enjoy. 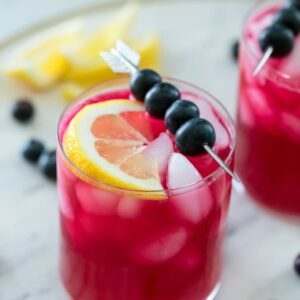 Though it’s quick to make, since it requires a lot of chilling time, you’ll want to get a head start. ARE RAW EGGS SAFE IN ICE CREAM? OK, this question is likely to bring up a lot of debate, so I’ll just touch on it briefly. Yes, I do often use raw eggs in my ice cream. I’ve made ice cream MANY different ways and think the recipes with a raw egg base truly taste the best. It’s only two eggs in two pints of ice cream and I always make sure to use farm-fresh, organic eggs when using them raw. And I always keep them in the fridge until ready to use. I’m not going to tell you it’s necessarily “safe” because there’s always a risk of salmonella or foodborne illness when working with raw eggs and if you’re immune-compromised or pregnant, I wouldn’t recommend using them. However, the first ever time I made ice cream, I used the Ben and Jerry’s cookbook (affiliate link) and all of their recipes use raw eggs… I figure they must know something about making good ice cream! If you want to make this recipe, but don’t want to use raw eggs, that’s also not a problem! Instead of mixing your cream, whole milk, and vanilla into the egg mixture, heat it in a saucepan just to the point of simmer. Pour half the hot mixture into the bowl with the whisked eggs and sugar, whisking the whole time (this is done to temper the eggs and not cook them into scrambled eggs). Then pour the egg mixture/milk into the saucepan with the rest of the cream/milk and cook over low heat for about 5 minutes, until mixture thickens enough to coat the back of a wooden spoon. Next up… White chocolate can sometimes be a pain in the neck to melt. My #1 tip for you here is very important… Use quality white chocolate and do not use white chocolate chips! Chocolate chips actually contain a hardening agent so they can keep their shape snd it makes it tough to melt them smoothly. I find this true of all chocolate chips, but even more so with white chocolate chips. Grab a couple white chocolate bars instead… It will likely be a bit more expensive, but so worth it. I also recommend using a double boiler (I have this one [affiliate link] and love it) or a homemade double boiler. 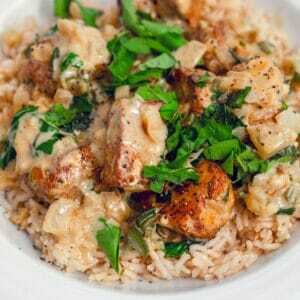 To make your own, just place a heat-proof bowl over a saucepan of simmering water. Make sure the bowl fits securely over the top of the saucepan as you don’t want any steam to be able to escape into the chocolate mixture. Gently stir the chocolate until it’s fully melted. I’ve always had better luck melting chocolate with a double broiler than I have in the microwave. And trust me, there’s nothing worse than a batch of chocolate that’s seized up and no longer useable. OK, now that we got all that out of the way, onto the rest of the recipe…. Which as I mentioned, is totally easy and is really only a few steps. After you melt your white chocolate and let it cool a bit, stir your eggs and sugar together in a separate bowl. Then add in the cream, milk, and vanilla. Stir in the cooled white chocolate, cover with plastic wrap and pop in the fridge for at least four hours. I know… torture. Then you’re ready to macerate your strawberries and process the ice cream. If you don’t have an ice cream machine, I highly recommend just getting the bowl attachment for the KitchenAid [affiliate link], so long as you have one of those. It’s super easy to use and if you always keep the bowl in your freezer, you’re always ready to make ice cream. Mix the strawberries with the rest of the sugar and mash them a bit. 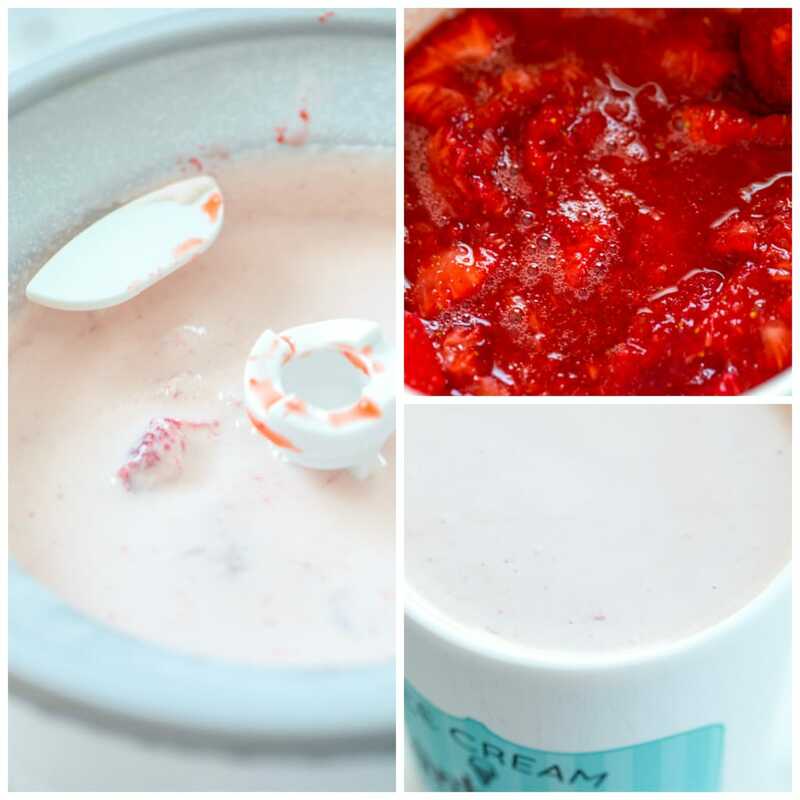 Then pop your chilled cream mixture into the ice cream maker and let it do its thing! Mine took about 20 minutes to process and once it was getting thick, I poured in the strawberry mixture. Then I poured it into my ice cream containers (I like these ones from Sur la Table [affiliate link]) and put back in the freezer for another 6+ hours. I know. That’s why I recommend making this a day ahead. I really like to chill my ice cream overnight. After so much waiting, I was definitely ready to dig into this ice cream! And I guess I should confess now that, despite my great desire to make this, I’m actually not the biggest white chocolate fan (I used to be OBSESSED. But I think one day, I ate too much….). But I can happily tell you that the white chocolate favor in this white chocolate strawberry ice cream is mild and creamy and definitely not sickeningly sweet. It’s possible that it’s making me fall in love with white chocolate once again! Chris absolutely loves white chocolate and actually told me that this is the best ice cream I’ve ever made (and trust me I’ve made a lot of ice creams… this isn’t even close to all of it!). Even though I made this one for the first time in 2012, we both must have forgotten how ridiculously delicious it was. And now I’ve been told I cannot let six more years go by before I make it again! If you’re a huge white chocolate fan, feel free to add some chunks of white chocolate to this, as well. Strawberries and white chocolate is such a match made in heaven and that would only amplify the flavor. There are LOTS of strawberries in this ice cream and they’re super fresh and vibrantly red and just as delicious as can be. I haven’t made nearly enough ice cream this summer and I’m starting to get a little sad that summer is going by so quickly. Guess we’re going to need to finish this one up tonight, so I can have empty ice cream containers ready to be filled again! And luckily, I’m not at all opposed to making ice cream long after summer has departed. Fall (read: pumpkin!) and holiday (read: gingerbread!) are some of my very favorite flavors. But now I’m kind of craving a super duper packed with chocolate recipe. Think I can make my own Phish Food? Do you like your ice creams fully loaded with chocolate or are you happy with fruit? 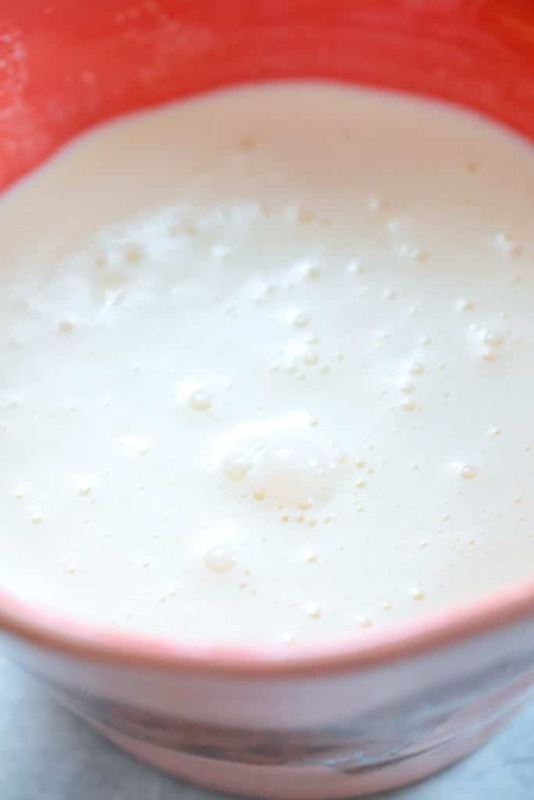 Place white chocolate and 1/4 cup milk in a double broiler over medium-heat (or in a heat-proof bowl set over a pot of lightly boiling water) and gently stir until melted. Once chocolate is melted, set bowl aside and let cool a bit. In a large bowl, whisk together eggs and 3/4 C sugar, until light and fluffy. Whisk in cream, remaining cup of whole milk, and vanilla. Stir cooled white chocolate into the mixture. Cover bowl with plastic, touching plastic wrap to the top of the mixture, and place in fridge to chill, at least 4 hours. Once you're ready to process ice cream, place sliced strawberries in a bowl, along with remaining 2 Tbsp sugar, and mash together a bit. Let sit for at least 5 minutes. Using your ice cream maker, process ice cream mixture according to manufacturer’s directions. Once the ice cream is starting to thicken, about 5 minutes before it's finished processing, add in sliced strawberries. Put ice cream into containers and place in fridge to chill for at least 6 hours. 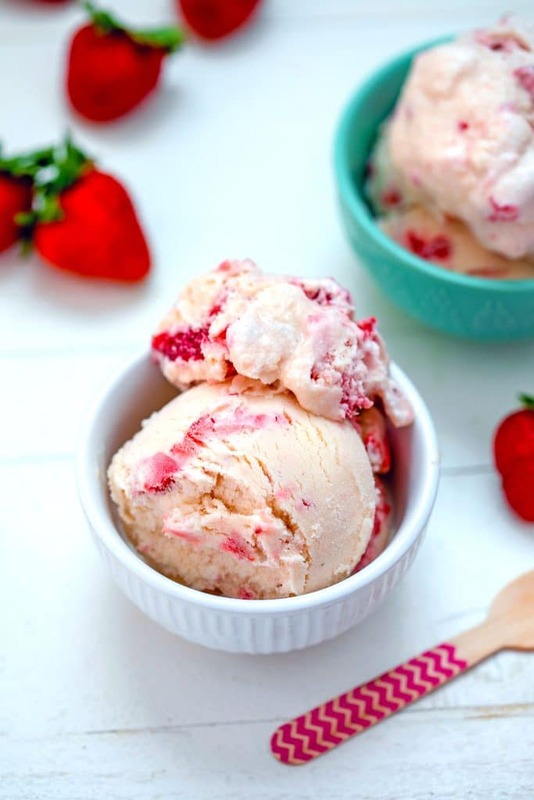 16 Responses to "White Chocolate Strawberry Ice Cream"
This combo has me drooling. DROOLING! I’m not a white chocolate person but that ice cream looks amazing! oh I’m so impressed- I love how everything is so fresh! I am definitely a fruit gal, especially black raspberry ice cream! This flavor looks delicious! I can’t wait to try it! And I’m a huge fan of Jeni’s Splendid Ice Creams too! We made the cherry lambic sorbet for Easter (amazing, the lambic fizz is still present in the sorbet!) and I can’t wait for raspberry-coriander to reappear. As for desserts, I bounce back and forth between chocolate and fruit all the time. As you know I am a big fan of anything chocolate too hehe but when it comes to ice cream, I’m more of a strawberry/vanilla girl! (Or dulce de leche. Or oreo. But usually I have a fruity ice cream in my freezer…) This ice cream sounds so perfect! I’m pretty sure I’d eat all 2 pints and then feel glorious after. Beautiful! I love love love homemade ice cream and although I’m a big fan of chocolate, non-chocolate ice cream often feels extra special (I’m sort of shocked to be even saying it but it’s true). This one looks crazy awesome. And prob even better over a brownie or warm cookie (ha, obviously I still had to add chocolate into the mix). 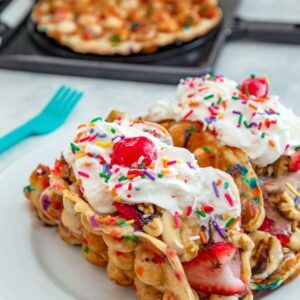 I see that this is from a while back but since it is new to me I had to chime in and say YUM – I am on the hunt for a new strawberry ice cream recipe and this looks awesome. I love everything about this ice cream! 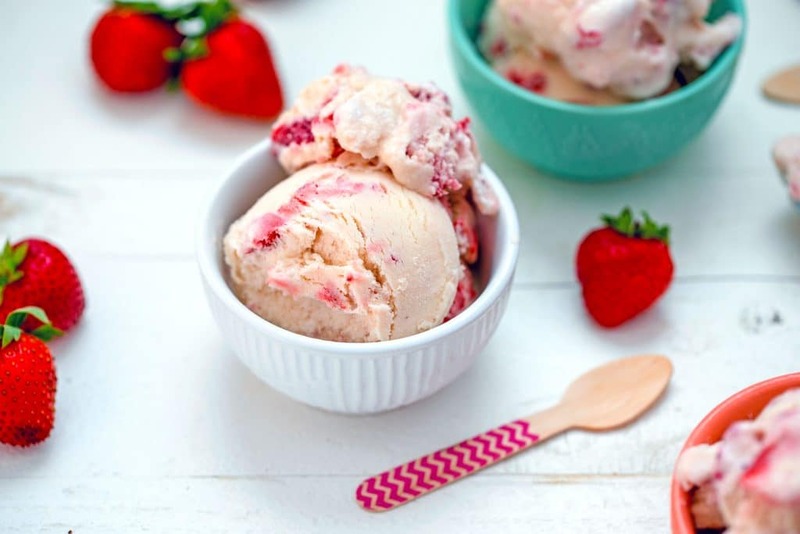 Combining white chocolate and strawberries in ice cream is pure perfection! 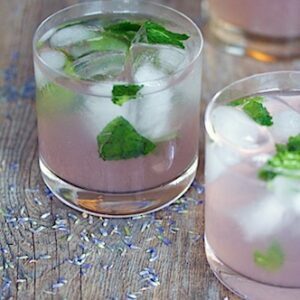 This sounds and looks so refreshing! I cannot wait to try it!